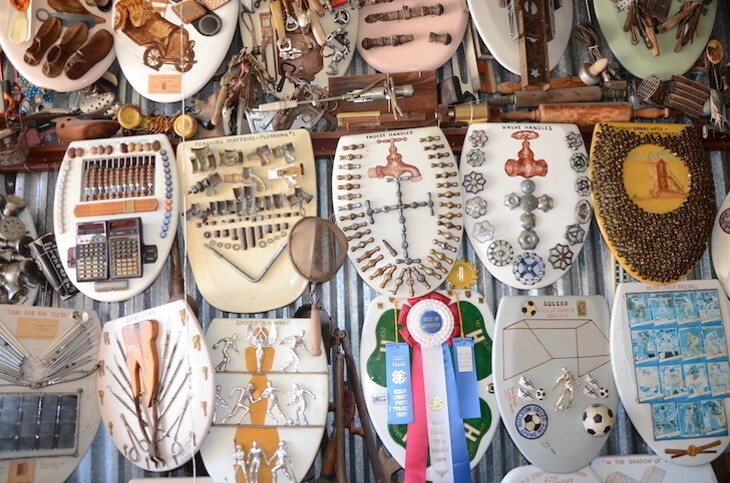 Barney Smith is selling his Toilet Seat Art Museum. 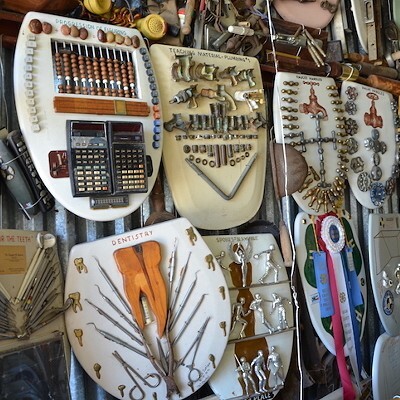 Without its tour guide, the museum is a labyrinth, one that the casual pedestrian would never suspect, hidden behind two tall metal doors in Smith’s home garage at 239 Abiso Avenue in Alamo Heights. 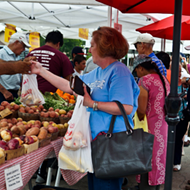 It’s open from 1 to 3 p.m., but please call first: (210) 824-7791. The tour begins. In a free-flow manner, Smith regales us with tales. Some of it is routine, some off-the-cuff. All on point; Smith is a master raconteur with a sharpshooter’s aim. 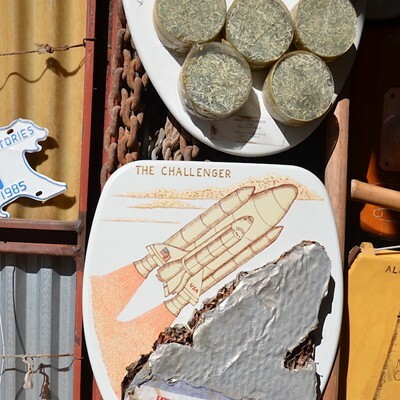 Have you seen … the Challenger? Mount St. Helens? Gregg Popovich? Brad Pitt? "Old Rip"? 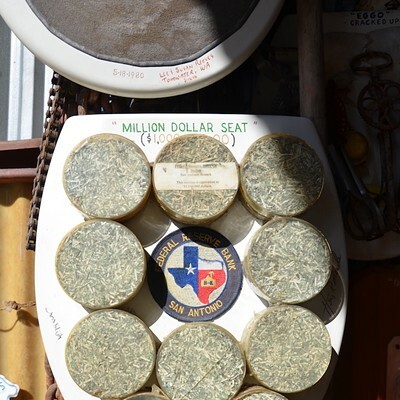 One million shredded U.S. dollars? Arkansas quartz? Saddam Hussein’s toilet? The Toilet Bomb? The Berlin Wall? The CIA? Rudyard Kipling’s poem "When Earth’s Last Picture Is Painted," glued to a painter’s palette and surrounded by communion cups filled with Smith’s old oil paint, the poem now faded and unreadable but no matter because Smith has recited it from memory since he was 12? Olympics? Bolivia? Trolls? Pogs? PEZ dispensers? 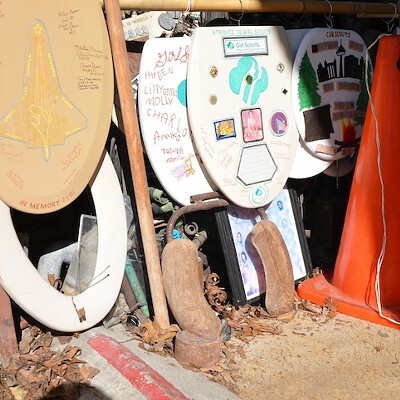 Travel the world through toilet seats — all 1,335 of them, to date. Our tour guide leads us through his long-form labyrinth, the limits of which are the seemingly limitless experiences of Barney Smith. 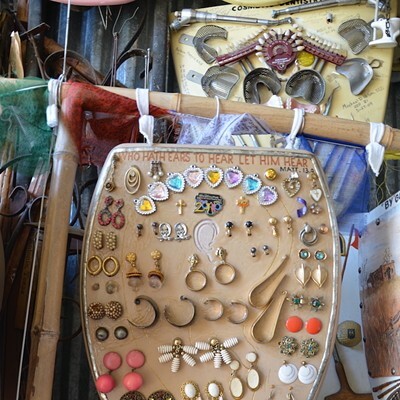 He swings his magic wand, a bamboo walking stick, from one toilet seat to the next, making contact without a glance, generating hypnotic punctuations: bamboo on molded wood, accents amidst his amusing anecdotes. The bamboo, he grew in his yard. The toilet seats, made of molded wood, are basically "sawdust, but don’t let the guys at Bemis hear you call it that." Molded wood is Smith’s favorite type of seat, better than plastic. It’s the easiest material to work with, especially when etching, which Smith does with a dental drill or burr. He’s worn out more than a few burrs over the years. Toilet seat art is labor intensive. 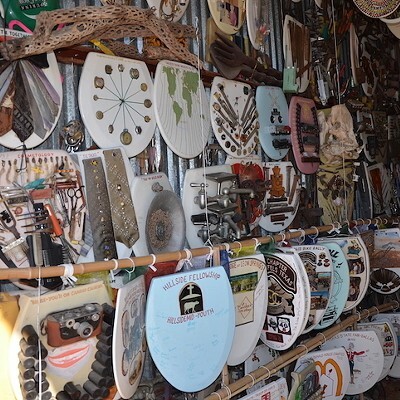 In addition to etching, Smith glues, mounts, solders, collages, scrawls, signs, burns, draws, drills, nails, paints, screws, cuts, clips, collects, combines and sticks things to toilet seat lids. A few other things too, I’m sure. Visitors participate too. We turn the seats over, take them down and handle them, sign our names in Sharpie, snap pictures, interact with, and even add pieces to the collection. Smith is inviting us to etch our own memories into the museum’s sentiment. And the museum’s sentiment is golden, owing to Smith’s golden disposition. 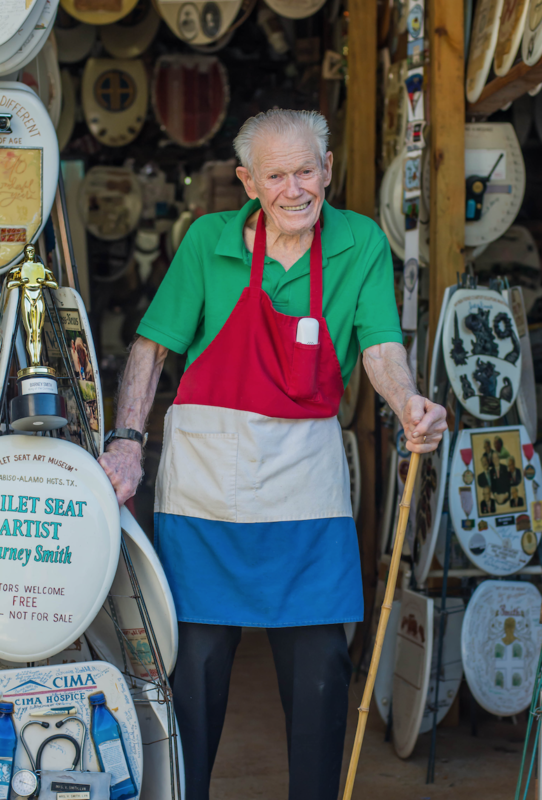 Barney Smith is like the Norman Rockwell of Toilet Seat Art, but more natural, genuine. He’s a bit like P.T. Barnum, too, but that’s missing the point. Sure, the museum is a kick. Shtick. One of The Great American Roadside Attractions. But it also has an emotional, historical and spiritual depth beyond its initial novelty. It is a place of memories and life. Especially local memories. On Saturday, January 6, per tradition, the Randolph Roadrunners, a walking club centered around Randolph Air Force Base, stopped by to sign a new seat. 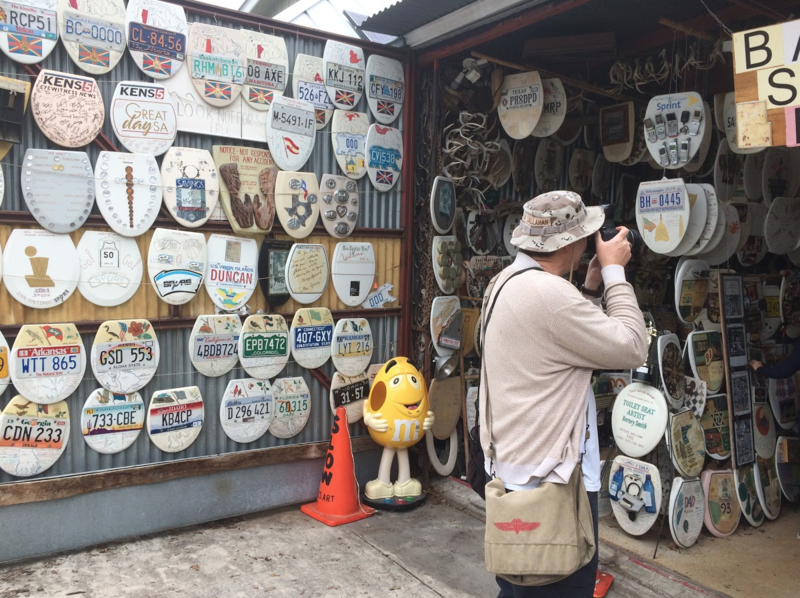 Rick White leaned in to get a closer look at the past 13 years of toilet seats created for the occasion, reading out names and reminiscing, with his dog and walking partner, Chelsea, by his side. It was their 128th walk together. 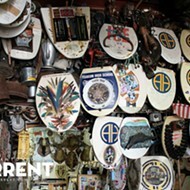 On that day, almost every volkssporter and visitor asked Smith where this or that toilet seat was in the museum. 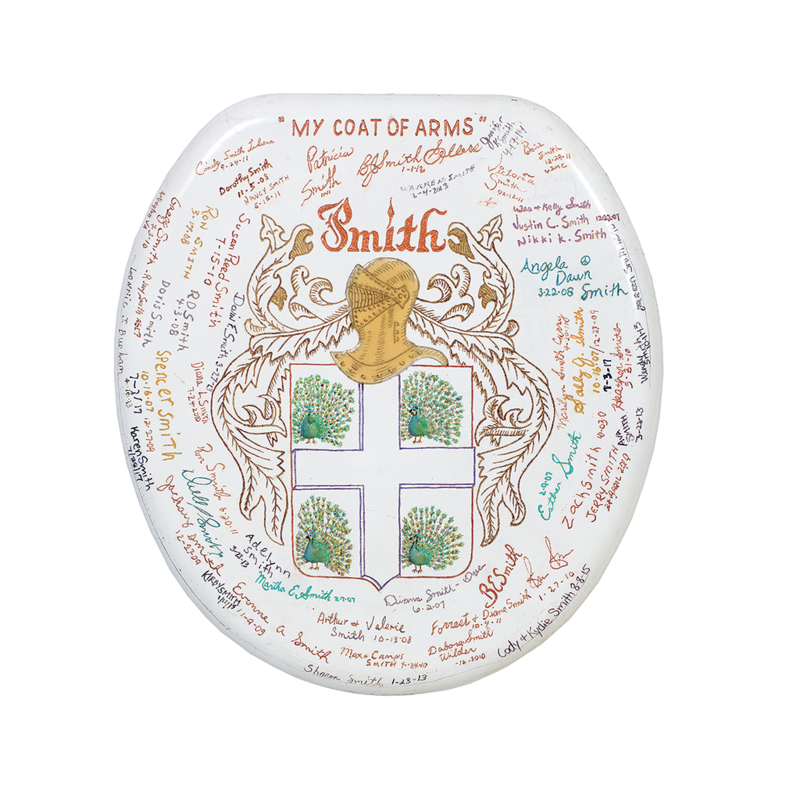 Almost everyone had a personal connection to Smith’s toilet seats. Toilet humor has no business here. 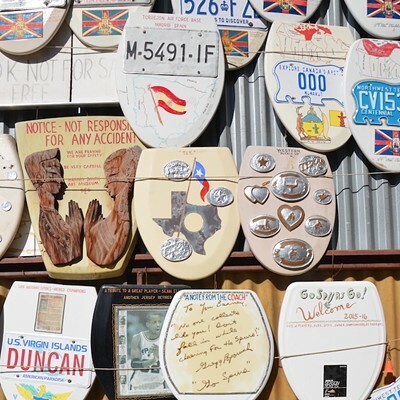 Any roadside traveler looking for scatological kitsch will be disappointed. 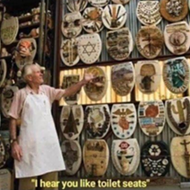 Those are clean toilet seats that Smith’s been using for the past 50 years, mind you. Seats so clean Clorox helped promote the sale of the museum last fall. Smith is always taking donations — he’s got an interesting list, go ask him what he needs — but one time someone donated used toilet seats. They didn’t get the memo. 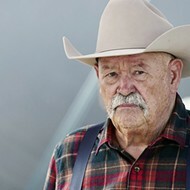 The bottom line is: Barney Smith is a good guy and a model citizen. He was a loving husband for 74 years. A devoted family man. A maintenance engineer at an orphanage. An illustrator for the publication Evangelica. A minister in Harahan, Louisiana. A master plumber. A volunteer firefighter for Alamo Heights (Smith, 96, and Clarence Balser, 97, are the last two firefighters from the volunteer days). A member of United Methodist Church for 32 years, where he used to teach a ceramics class. "Daddy’s done everything but work on car engines," his daughter Julia Murders said. He’s also persuasive, in the most charming of ways. When Smith asks you to do something, it doesn’t feel like a favor, but an opportunity to be a part of something very special. We want to help. Many do. Like Allen Rindfuss (brother of Current Managing Editor Bryan Rindfuss), who organized Smith’s 95th surprise birthday party on May 25, 2016. Like former Mayor Louis Cooper of Alamo Heights, who stopped by the party to officially declare May 25 "Barney Smith Day." Like Carye Bye, founder of the online advocacy group "Friends of B.E.S.," who has served as the museum assistant since 2016. She wrote that her duties include "penning over fading names on toilet seats, fixing toilet seats that have parts that have fallen off, drilling holes in license plates, penciling in ruler marks," cutting back the bamboo, making grilled cheese sandwiches ("very rarely"), and much more. Like Smith’s daughters Julia Murders and Brenda Sellers, who help their father around the house. Murders also negotiates with prospective buyers. Like Smith’s grandkids, Kristopher Livermore and Regina Mantooth, who moderate online content regarding the museum. "We just want daddy to be happy," Murders said. 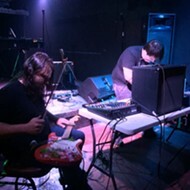 Like Daedelus Hoffman and Lindsay Starr, who run Cattywampus Press, a micro publisher based in Austin. 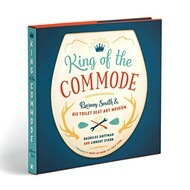 They spent six months documenting Smith’s work, and will publish a book about Smith’s life and work, titled King of the Commode. The book is being funded through a successful Kickstarter campaign, which exceeded its goal of $30,000. Starr said they hope the book "will demonstrate to cultural institutions that [the museum] is worthy of preservation." The book launch party will take place on Saturday, May 26, the day after "Barney Smith Day." Speaking of King of the Commode, I asked Smith when he was first crowned. "Montel Williams is the one who first made mention of the ‘King of the Throne.’"
Besides Montel, Smith has appeared on The View and The Tom Green Show, among others. 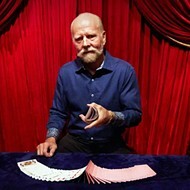 He’s hand-dubbed his televised appearances onto a VHS compilation, which he shows loud and looped on a 13-inch screen in the far right corner of the museum. At one point, the video jump-cuts to a buffalo wing eating contest. 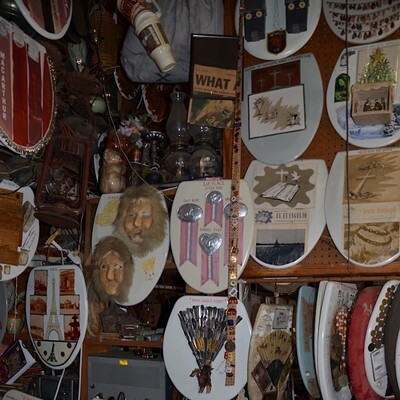 "They said, ‘You want into it?’ I said, ‘No, I don’t want to be full of chicken wings before my interview.’"
To an outsider, the museum is outsider art. 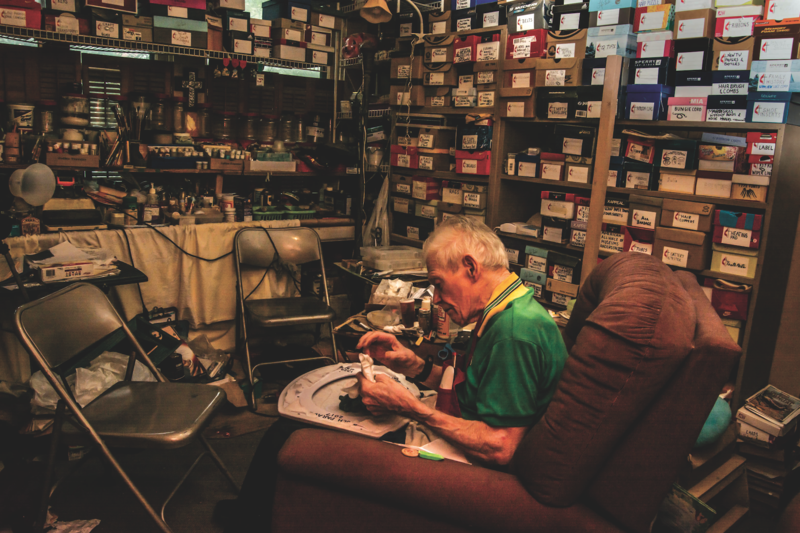 But to an insider, there’s nobody more inside, more embedded in their community, than Barney Smith. In his own peculiar way, he has created a library of local legends and lore. "I did that immediately. The next day, I took them down, and gave them away to my kinfolk." 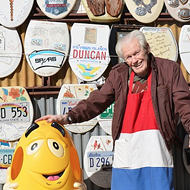 And now, Barney Smith is selling his Toilet Seat Art Museum; the money will go to his daughters. To this day, there is no concrete offer for the collection. Julia Murders mentions "minor bids" from India. 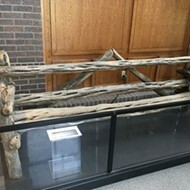 South Dakota. Still others mention Idaho. Baltimore. "I don’t know where they’ll be going. I think London has already mentioned that they want it, and Germany, or some other foreign country. That’s too far for the Roadrunners to come by, or for the [Fiesta] Pooch Parade. They won’t be going up to London to have a Pooch Parade," Smith said. 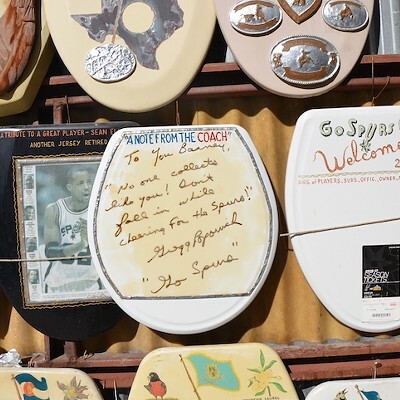 What has happened in spite of a sale is an increase in press coverage, a spike in museum attendance, and an urgency to document the legendary Toilet Seat Art Museum. I find it difficult to picture the museum relocated and without its tour guide. In the meantime, there’s a lot going on, too much to dwell on speculation. As they say, the future will have to wait. 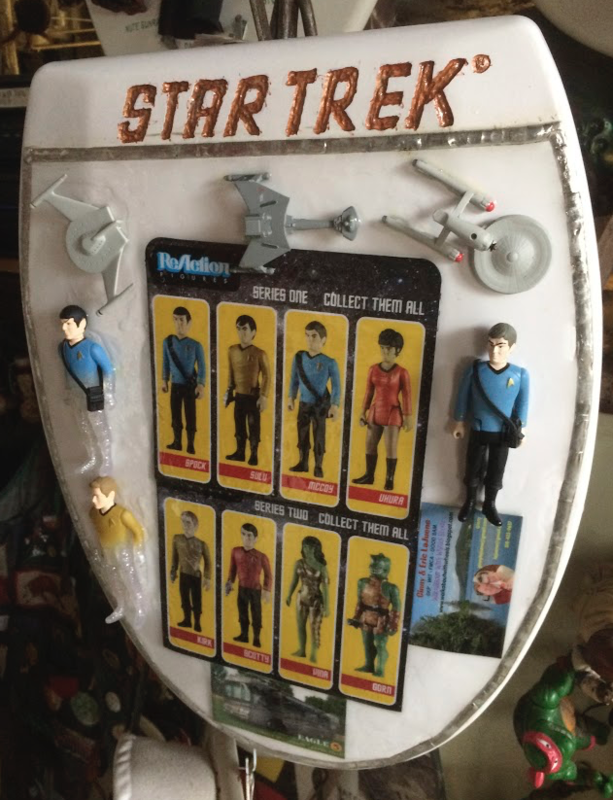 In the meantime, see his latest work, an homage to Star Trek. Pick up the 2018 Toilet Seat Art Museum wall calendar. RSVP for the book launch party in May. Prepare for the Fiesta Pooch Parade. Get hypnotized by the sound of bamboo on molded wood. Sign a toilet seat. Enjoy the show. 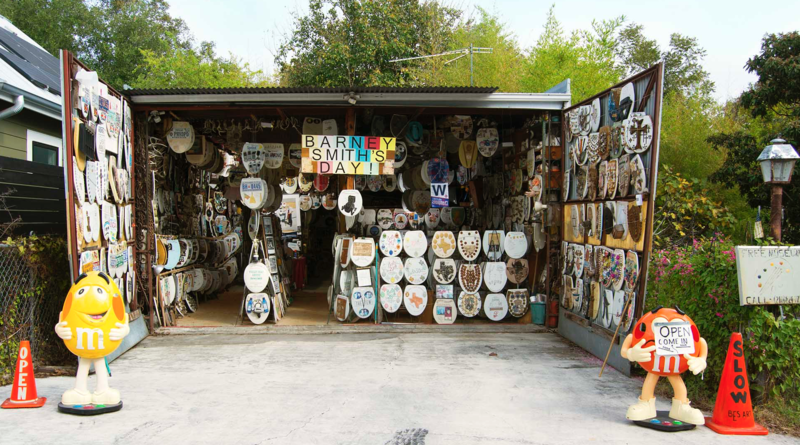 Visit the one and only Barney Smith’s Toilet Seat Art Museum! A Great American Roadside Attraction! 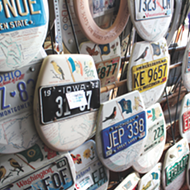 A dynamic display that attracts visitors from around the world! Lebanon! Australia! And 80 other nations! 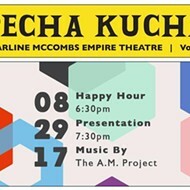 A colorful collection of multi-disciplinary art! A History of the World as seen through the eyes of the one-and-only Barney Smith! As seen on TV! Later, toward the end of the tour: "It’s the first time I’ve been out. I got chilled the other day and I had to stay in the bed for two days. This is the first time I’ve been out, with that sun shining on my head. I’ve got to get my hair out of my eyes so I can see my way around. I tell you. But anyway, I enjoy coming out here and looking and talking about my toilet seats. But some of these days it’s going to be gone, and I’ll be gone, and I’m ready to go, to see where my wife went, and my daughter, be with them. So, I’m ready to go." "God’s letting daddy go on because he’s having so much fun," Murders said. "He enjoys people. He’s a people person." 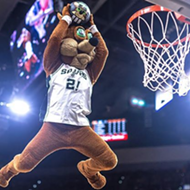 He’s your neighbor, so stop by, make an offer.